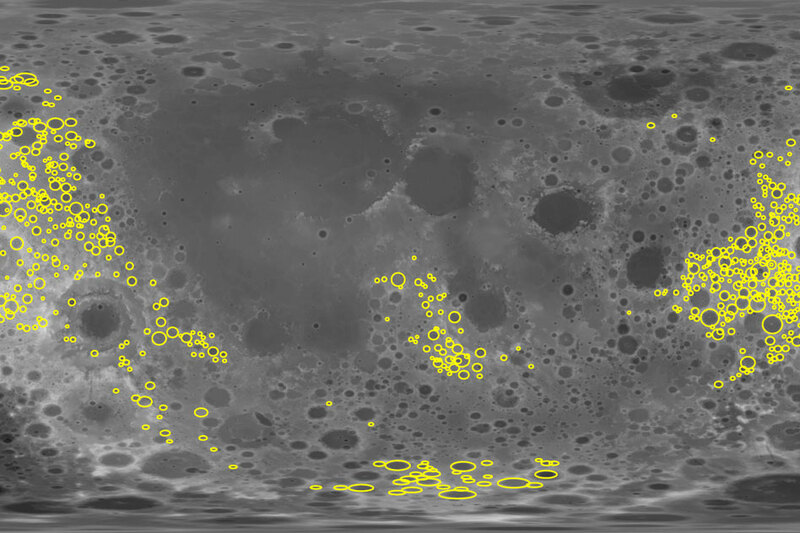 Researchers analyzed the gravity signatures of more than 1,200 craters (in yellow) on the far side of the moon. 1 Comment on "Small Asteroids Completely Shattered the Moon’s Upper Crust"
Why is it that we are working with an assumption that the moon is solid? re-do the math with a shell, instead of a solid core model. Those alternating rings of density become a whole lot more explicable if we look at the shell as a semi-elastic resonant surface. The only way the moon could have formed as a near-perfect sphere, from the earth, without millions of other moons being produced is by the flyby of a large object, deforming the earth shell and calving a moon. The calved material formed a new bubble, capturing all but a tiny spray of material that fell back to pepper its rear side. Hence, the moon and earth having exactly the same composition, the moon being tidally locked, the gentle bounce between the orbits and the sound which ebb and flow generated when they hit, which you still have not released data on.